The Remote Island Diabetes Education (RIDE) program is the "educational" arm of Sea Mercy's Floating Health Care Clinic (FHCC) operations in the South Pacific. Sixty years ago, diabetes was virtually unheard of in the South Pacific. Today, diabetes is so prevalent that the news from a doctor is rarely good. 40% of the Pacific island region's population of 9.8 million has been diagnosed with cardiovascular disease, diabetes and hypertension. These three diseases account for 75% of all deaths across the South Pacific and 40-60% of total health-care expenditure. A major challenge for Pacific island countries is to reinforce nutrition education in schools by promoting healthy eating practices. On the few primary islands, the message is slowly getting out, but on the 1,000's of more vulnerable remote islands, there is very little access to nutritional or behavior education, creating a deadly epidemic and a desperate call for help. 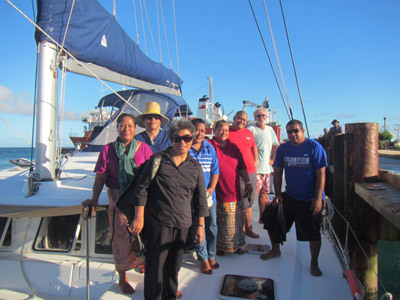 Sea Mercy's RIDE (remote islands diabetes education) Program offers the best "educational delivery" solution for the remote islanders of the South Pacific. It starts with educating the school age children before the bad nutritional habits are developed, educating the adults about healthy eating and physical activity, and then providing the medical evaluation and treatments needed to give them hope. Because Sea Mercy's volunteers and programs are self funded (we receive no government assistance), we rely on donations to help us deliver the RIDE program to the thousands of remote islands across the South Pacific. Any donation amount that you can provide will help us change the destiny of a forgotten and neglected people. Your contribution of any amount will help treat & prevent diabetes and avoid preventable complications - including blindness & amputations. Scroll down to learn more about our RIDE program where how your donation is used. PayPal or Credit Card I will send payment by check. A Tongan father holds his daughter, both nervously watching through a window as the Sea Mercy doctors and staff evaluate his at risk wife for diabetes. Sea Mercy is answering the call! Operating from a growing fleet of Free remote island Floating Health Care Clinic's (FHCC) serving the remote islands of the South Pacific, Sea Mercy has teamed up with Certified Diabetes Educators, Pharmacists, Ophthalmologists, and the Health Ministries of their island nation partners, to develop and deliver a diabetes education and treatment program for their neglected remote island people. 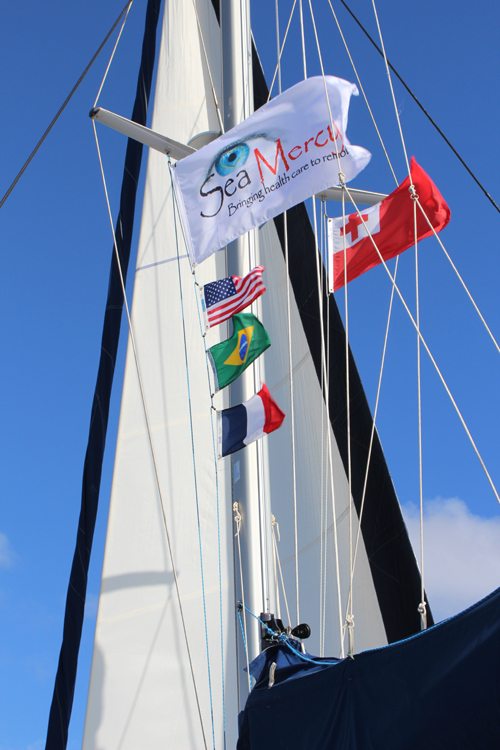 Sea Mercy's RIDE (remote islands diabetes education) Program offers the best "education delivery" solution for the remote islands of the South Pacific. "Our goal is to turn back the "diabetes risk" in an effort to change the destiny and future of the people living on remote islands before it is too late." Julie Dewsnup, RPh, CDE who is the diabetes program director for Sea Mercy. "It starts with educating the school age children before the bad nutritional habits are developed, educating the adults about healthy eating and physical activity, and then providing the support and tools needed to make changes." "Adding the RIDE program to our remote island FHCC operations was the perfect solution to a growing problem," says Richard Hackett, President of Sea Mercy. "50-60% of all our health care staff's efforts, prescribed medicines and supplies were focused on treating diabetes related issues. Without the RIDE program as a part of our service, there will never be enough vessels, doctors, or medicines to treat this growing epidemic." Diabetes education was never this much fun, or memorable. During the FHCC operations during the day, we pass the word to the patents treated that there will be a movie night after the evening meal and that they are invited. This creates the perfect environment for us to attract and communicate our vital message to the islanders. We now have a program that the remote island people will look forward to watching everytime Sea Mercy's FHCC visits their remote island. Follow-up individual educational sessions will be available for all who are interested, The movie night will be a great introduction to the diabetes care Sea Mercy will provide. Although the message is the same, each island nation requires a unique set of video's (native language) to be produced. There are 11 island nations we have targeted for this program and some will have several FHCC vessels operating in each (i.e. Solomon Islands has 300+ inhabited remote islands). Below are the costs to create and deliver a RIDE program for each of our island nation partners.